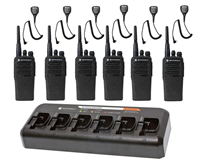 Investing in two way radio walkie talkies at your high school provides plenty of positive return. Use your two way radios to monitor school safety during emergencies, quickly get help with student injuries, and use your dedicated weather alert channel to keep track of potentially dangerous weather in your area. Two way radios will improve communication across departments from your administration department and teachers to janitorial team and athletics staff. Constantly being aware of situations and needs will help your high school operate smoothly and have more time to focus on the students. Two way radios have the option of offering multiple channels, allowing you to group your departments so the message only gets to the people who need to hear it. Not only do two way radios enhance communication during the school day, you can take advantage of your investment by utilizing them at after-school events, sports games, summer camps, field trips, and more. With rechargeable long-lasting lithium-ion batteries, Motorola two way radios can work all day and be ready to be used again the very next day.